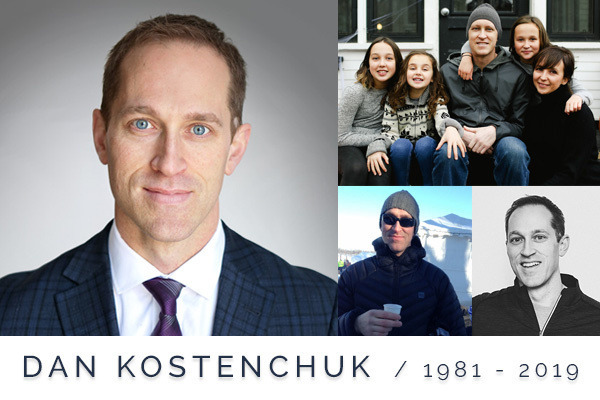 On January 20th 2019, Dan Kostenchuk lost his battle with cancer. My sister lost her husband and my three young nieces (Pilot, Penn & Poet) lost the love of their lives - their Dad. This GOFUNDME page is dedicated to the memory of Daniel Kostenchuk and will fund an education trust account for each of his amazing daughters. Dan believed in the importance of education. In this world, nothing can be said to be certain but death and taxes. ~Benjamin Franklin. C. DANIEL KOSTENCHUK passed away after a short and tragic battle with Lung Cancer. A much-loved introvert, Dan died the night of his 38th birthday, January 20, 2019. He died just as he lived: trying hard to get out of social gatherings. Dan did not smoke and he did not drink much either. Dan was healthy, athletic, and practical. Dan wasn’t chatty, but he was quietly charming. He didn’t complain and he didn’t hesitate to help. He didn’t believe in wasting money, food, words or time. Born in Winnipeg in 1981, he grew up doing typical Canadian things in the heart of Charleswood with his big brother. He loved the outdoors and enjoyed adventures with his friends. From a young age, he was an accomplished golfer and won several provincial junior titles, tournaments and friends. Dan attended St.Paul’s High School (Grad 1999), then the University of British Columbia on a golf scholarship. He returned to the University of Manitoba where he graduated with top honours and a CA designation (2006). Later he taught classes at the Asper School of Business. Although most people thought he was crazy for loving taxes - he was a true wizard of the Canadian Tax Act. He took pride in being a Chartered Accountant and found great satisfaction in saving people from over-paying the government. He was a brilliant problem solver. Strangely, he was inspired by ideas like income splitting and exemption laws. Dan loved being a tax expert - partly because so few people understood it and partly because he liked to sign passports. He was very excited about recently joining the team at BDO as a partner. Dan loved being alive. Aside from income tax, he didn’t take life or himself too seriously. He was kind and funny. If you were lucky enough to get to know him then you knew he was easy to love - especially Summer Dan. (Summer Dan was the livelier, more carefree version.) He was happiest hanging out with this three daughters; Pilot, Penn and Poet - teaching them the fine arts of bonfires, snow forts, swimming, tinkering, bike-riding and peeing in the bushes. He will be lovingly remembered for the way he’d turn off the lights and start the dishwasher to signal the party was over. And how he excelled at everything he did - like cross fit, mountain biking, gardening and even hot yoga. Dan was a kid at heart. He loved Halloween and any opportunity to dress up in costume. He was a happy coach for the girls’ Kids Of Mud mountain biking group and gleefully used it as an excuse to buy them Slurpees at 8pm on weeknights. Dan was surprisingly talented with miniature sewing machines and glitter-based crafts (much to his daughters delight) which he did for hours without complaint. His regrets include the time he rolled down the hill at the Banjo Bowl after Kam Barteski fed him too many beers, the night he nearly called the cops on his rowdy (but favourite) neighbours, and most regrettably the fact that he never reached old age - he was really looking forward to it (he had even pre-purchased a sweater vest). He loved getting dirty and working hard. He could build anything and fix most of the things he broke. He also loved camping, fishing, fireworks, Scotch mints, the occasional beer, and Brian Johnson’s short ribs with mashed potatoes. His most proud achievement in life was having a family of his own. He was a positive and gentle role model. He was a calm, reliable, loving force - a true gift to his daughters. He read the girls so many children books he sometimes recited them in his sleep. There was no place he’d rather be than with his girls and they felt the same. In fact, when his girls were born he hung up his golf clubs citing he didn’t want to ‘waste time he could be spending with his kids’. Dan was a confident leader, a devoted father, and a generous husband. Unfortunately, he did not like polar bears very much, but no one is perfect. He was fiercely loved and will be greatly missed, especially by his tax-inept wife. It would be remiss not to mention how much yellow Labradors made him happy, but also how he ended up with three dramatic, fat French Bulldogs instead. Dan was predeceased by his aunt; Pat Redman and his grandfathers; Kaz Rudniski and John Kostenchuk. Dan is survived by his wife (Kal Barteski) and daughters (Pilot, Penn and Poet); a complex network of family members including his mom, dad, step dad, step mom, full brother, half-brother, step-brothers, step-sisters, aunts, uncles, cousins, nephews, nieces, grandparents, in-laws, outlaws, mobsters and close friends. Dan would be severely uncomfortable with the attention from this obituary, but Dan’s family would like to thank the countless people who cared for him; the nurses and doctors, but also the exceptional community of neighbours and friends contributing delicious meals, errands, childcare and unwavering moral support and love. Thank you to BDO for continuing to reach out to him. Special thank you to Dr. Bruce Martin for treating Dan like a star. You can honour Dan’s life in many ways, most conveniently by raising a glass of moderately priced spirits, BUT MOST IMPACTFULLY by choosing to cherish the time you have with the ones you love, AND ALSO by not giving your accountant jumbled up receipts in a plastic bag at tax time. A party will be planned to celebrate Dan’s life in the summer of 2019. Dan did not see value in cut flowers - so in lieu of blooms, donations can be made to the educational trust funds of his daughters.